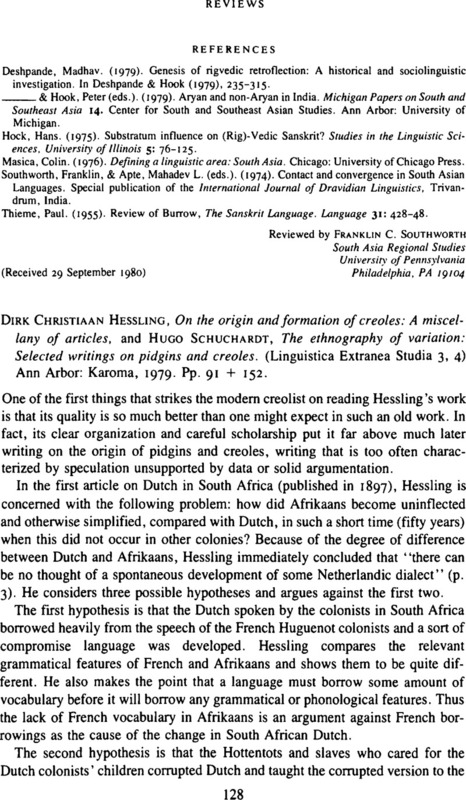 Dirk Christiaan Hessling, On the origin and formation of creoles: A miscellany of articles, and Hugo Schuchardt, The ethnography of variation: Selected writings on pidgins and creoles. (Linguistica Extranea Studia 3, 4) Ann Arbor: Karoma, 1979. Pp. 91 + 152. Hall, R. (1943). Melanesian Pidgin English: Grammar, texts, vocabulary. Baltimore: Linguistic Society of America. Woolford, E. (1979). Variation and change in the i predicate marker of New Guinea Tok Pisin. In Wurm, S. (ed), Papers in pidgin and creole linguistics, no. 2. (Pacific Linguistics A57), Canberra: Australian National University. Wurm, S. (1971). New Guinea highlands pidgin: Course materials (Pacific Linguistics D3), Canberra: Australian National University.